Ah, the Skaven. Sure, they look like enormous rats – and are therefore disgusting – but are they evil? Fatshark’s fun first-person kill ’em-up game Vermintide tasked players with murdering hundreds of poor Skaven without really thinking about it. But perhaps we should think about it. 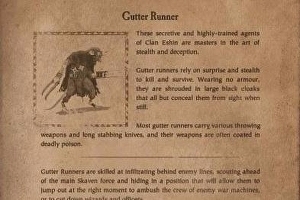 Perhaps we should think about whether Warhammer’s rat race are simply misunderstood. You know what we need? Lore! Usefully, Fatshark’s putting out a free DLC for Vermintide that adds a lore book (the page is live now). Download the DLC and you’ll find unique lore book pages strewn around Vermintide’s various missions and DLCs. Pick them up and you’ll slowly unlock the story behind the various locations and enemies in the game. That’s right: the Skaven get the chance to have their say.